Becca works on chocolate quality, team safety, and risk at our SF Valencia location. She enjoys the science that explains how chocolate works. Her favorite bar at the moment is Gola Rainforest, Sierra Leone. And yes, she once left chocolate to accidentally melt on the backseat of her car. When bad things happen to good chocolate from improper storage. Left to right: fresh chocolate, streaked chocolate (when the cocoa butter separates), and sugar bloom (when sugar crystallizes on the surface). Leaving a bar of chocolate in your hot car will surely ruin your day. So much work goes into making a Dandelion chocolate bar: we bring beans into the factory from all over the world that undergo a meticulous production process to transform them into glossy chocolate. We wrap each bar in gold foil and make sure the label lines up. And then just like that, the whole thing is a puddle. The chocolate tastes great in the short term (yum! molten chocolate! ), but after that it’s messy and, without retempering the chocolate, the bar won’t ever be the same again. So, in the interest of having the best chocolate-tasting experience days, months, or years from now, I share a few pointers on how to properly store tempered, finished chocolate bars. ● Squirrel it away somewhere cool and dark; the back of your pantry is ideal. ● Keep it away from strong odors. Cocoa butter can absorb strong flavors like garlic and coffee, which can alter the delicate flavors of the chocolate. ● Keep the bar away from heat and out of direct sunlight. The stable form of cocoa butter (Form V or 𝜷V) starts melting at 84°F. Tempered chocolate is a sol: a suspension of solid particles (cocoa solids, sugar) in a liquid (cocoa butter). It can separate just like the emulsion of oil and vinegar in a vinaigrette, except with chocolate you get dark cocoa solids and white streaks of cocoa butter. If a chocolate bar melts in your beach bag and you pop it in the fridge to resolidify, the bar will likely have a streaky appearance, a soft break, and it will crumble when you bite it. The appearance may be unpleasant, but it’s still safe to eat. I recommend melting it into brownies or some other delicious chocolate-based dessert. ● For storing chocolate longer than a few months, keep it in a temperate climate: we’ve had good results storing our chocolate between 40-68°F. The kitchen pantry is ok, but a cool closet or basement area are ideal. ● Stable temperatures are best. Chocolate’s appearance and texture can be affected by transitional bouts of hot and cold. 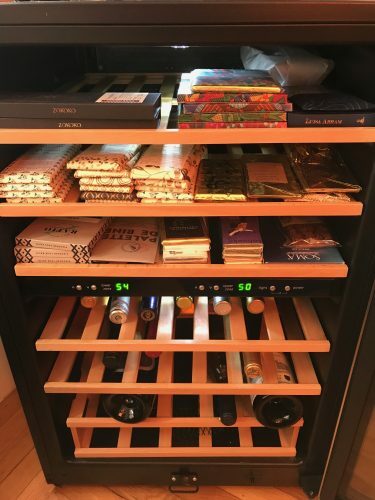 ● For cellaring chocolate and holding on to vintage bars, I recommend using a wine fridge set to 50°F. Note that a regular kitchen refrigerator may have strong food odors and it is often too cold for the task (below 40°F). Greg, our Chocolate Sourcerer, and Todd, our CEO and co-founder, set their chocolate refrigerators to 50°F. If chocolate gets too cold or undergoes a temperature shock, condensation can form and potentially cause sugar bloom. Sugar bloom changes the texture and appearance of the bar. It occurs when the sugar in the bar absorbs water and, when the water evaporates, it recrystallizes on the surface of the bar. It’s still safe to eat, but the chocolate’s appearance and texture make it better for baking. ● Never freeze chocolate for all of the same reasons as above. ● All of our chocolate bars have a “best if used by” date of one year from production. This is the time period during which we’re confident that the flavor notes you’ll taste in our bars will be as close as possible to when the bar was first tempered. That said, the flavors in our bars evolve over time, and some chocolate even improves with age. 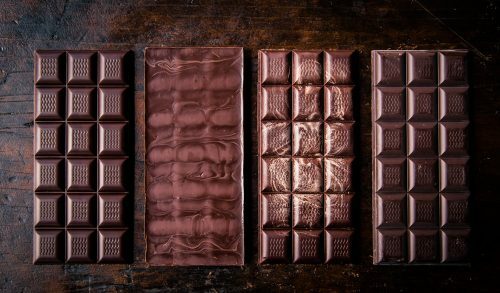 ● After a year or two in storage, it’s possible for chocolate to start looking dull and a bit grey on the surface and acquire a brittle, chalky texture. Over time, cocoa butter transforms into an even more stable polymorph known as Form VI or 𝜷VI. As long as you’re storing the chocolate in controlled conditions, it should be safe to eat for several years. ● Chocolate like ours with just cacao beans and sugar tends to be shelf stable. You don’t need to worry about two-ingredient chocolate going bad. In milk chocolate or bars that have nuts, those other ingredients can become rancid over an extended period of time. The chocolate/wine refrigerator of Greg, our Chocolate Sourcerer. What a collection! This information was helpful; I have wondered for a long time about these issues and I thank you for these answers.